Project Puffin, also known as National Audubon Society's Seabird Restoration Program (SRP), originated in 1973 as a project to restore breeding Atlantic Puffins back to historic nesting islands in the Gulf of Maine. In addition to puffins, Project Puffin works with Common, Arctic, and Roseate Terns. The program now manages 7 seabird nesting islands for the National Audubon Society. Celebrating its 40th anniversay July 15, 2013, the techniques developed by this innovative restoration project serve as a model to the world. 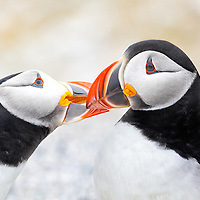 To learn more about Audubon's Project Puffin, visit their website at projectpuffin.audubon.org. 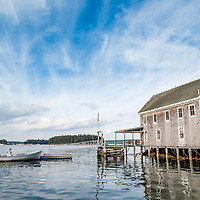 Located in Musgongus Bay in Bremen, Maine, Hog Island is home to part of the Todd Wildlife Sanctuary as well as to Hog Island Audubon Camp, which is operated by Project Puffin (the National Audubon Society's Seabird Restoration Program). The Hog Island Audubon Camp is the longest running environmental education program in the United States. Programs focus primarily on ornithology, ecology and conservation, and are open to people of all ages. Seal Island National Wildlife Refuge lies approx. 22 miles southeast of Rockland, Maine. The rocky island is home to a restored seabird colony of puffins, razorbills and terns. Seal Island is actively managed for colonial nesting seabirds, including Atlantic Puffins, by National Audubon Society's Project Puffin in cooperation with the Fish and Wildlife Service. Seal Island is closed year-round to public access. Stratton Island is located in Saco Bay, 3 miles east of Old Orchard Beach, Maine. 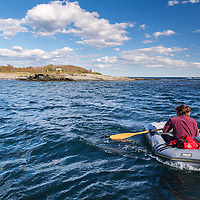 This 24-acre island is notable for having the highest diversity of nesting waterbirds of any Maine island. Stratton Island is the centerpiece of the Phineas W. Sprague Memorial Sanctuary, which is owned and run by the National Audubon Society. Bird banding (also known as bird ringing) is one of the most effective ways to study the biology, behavior, movement, longevity, breeding productivity, sources of mortality, and population demographics of birds. Additionally, according to the USGS, data collected from bird banding is used to "monitor populations, set hunting regulations, restore endangered species, study effects of environmental contaminants, and address such issues as Avian Influenza, bird hazards at airports, and crop depredations." Photos of the 2013 wading bird census on Stratton Island, Maine. The north side of Stratton Island is dominated by a pygmy maritime deciduous forest that provides vital nesting habitat for a number of wading bird species, including Great Egret, Snowy Egret, Black-crowned Night Heron, Little Blue Heron, and Glossy Ibis. 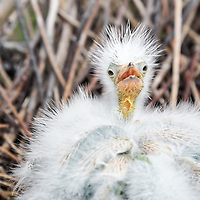 During the annual wading bird census, each nest in the wading bird colony (heronry) is identified and the number of eggs and/or chicks in each is counted and recorded.